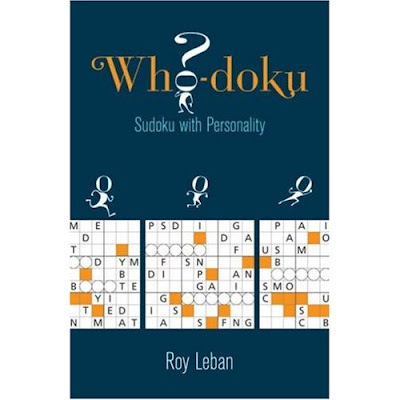 My first puzzle book, Whodoku - Sudoku with Personality is now out, published by Sterling Publishing. My inspiration for the book was some disappointment with sudoku puzzles. Unlike crosswords and many other puzzles, there is no overall point to a sudoku -- it's just numbers. When you were done, you were done. I wanted something that took it a step beyond that and came up with Whodoku. Each puzzle starts with a trivia fact. For the middle puzzle on the cover (which is puzzle #1 in the book), the fact is "He represented _ _ _ _ _ _ _ _ _ _ _ in the U.S. House". The blanks get filled in by the circled squares in the puzzle. If you figure out one of those words early, you can fill in the extra letters in the puzzle and get a leg up on the sudoku logic. Next, the shaded letters drop down below the grid to provide the name of the person who fits the trivia fact. For puzzle #1, you'll see: _ E _ _ L _ and _ O _ _ stacked one above the other. In columns with more than one shaded letter, you'll have to figure out which letter goes in which blank. Again, if you figure out the name early, you can get a leg up on the logic. Some puzzles have extra hint letters like this one, but most do not. The puzzles get harder as you go through the book. @Eric: Thanks for the suggestion. I just posted a sample at www.whodoku.com. Enjoy!